Colour Correction has been one of the biggest beauty trends of the past few months. It seems like almost everbody has written a post or made a video about it so now I'm here to share my own opinion this time. This trend has actually been around for years, used mostly by the makeup artists, but is now becoming much more accessible to the common people. It seems like every brand has come out with a version of their own - from concealers, primers, palletes, etc. 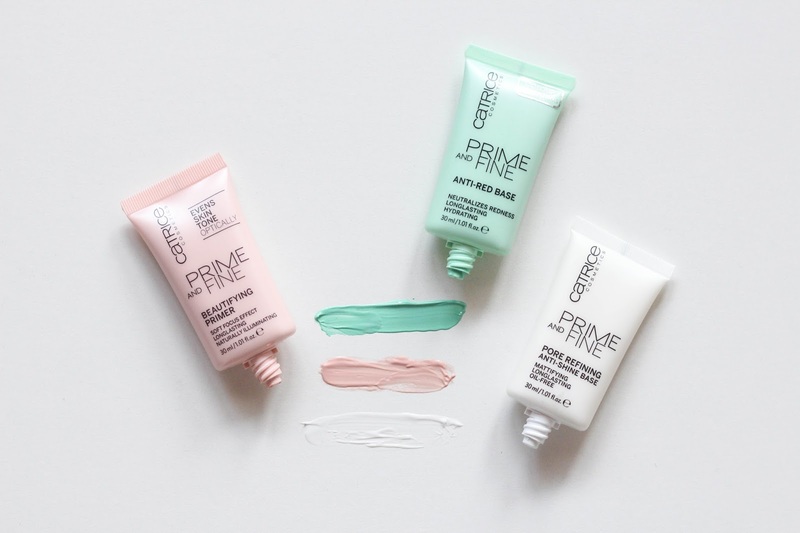 When I was casually snooping around the local drugstore I came across the Catrice Prime&Fine line, which sounded really interesting and affordable. That's why I decided to jump on the bandwagon and try out the colour correction trend for myself. Prime&Fine Anti-Red Base, neutralises redness, long-lasting, hydrating. What it claims: Soft green primer neutralises redness and gives a long-lasting even skin tone. Hydrating. Dermatologically tested. 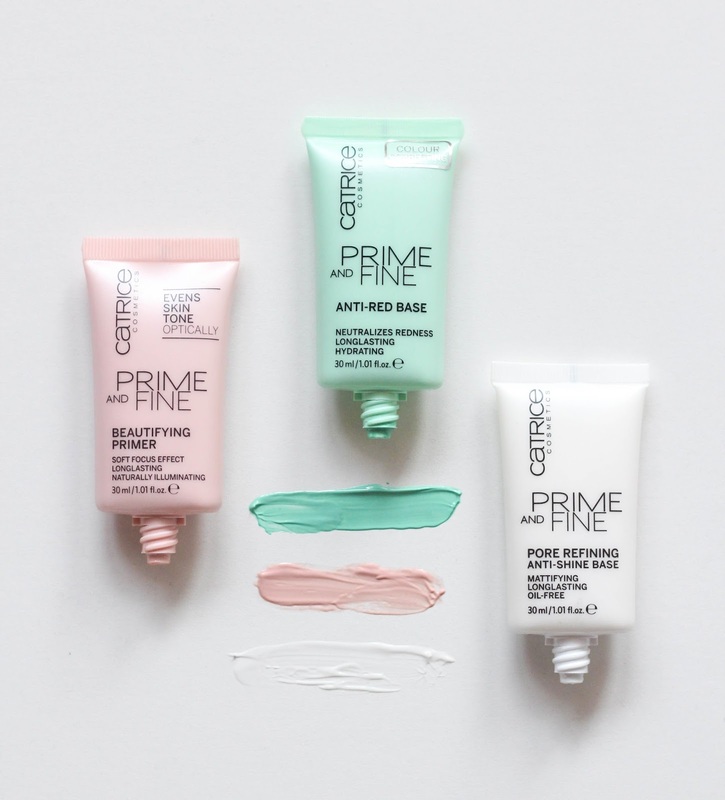 Prime&Fine Beautifying Primer, soft focus effect, long-lasting, naturally illuminating. What it claims: Soft rose primer with light-reflecting pearl pigments and vitamin E instantly gives a luminous glow. The long-lasting silky texture illuminates and optically creates a more even skin tone. For a beautiful and healthy looking skin. Improves make up wear. Use alone or under make up. Dermatologically tested. 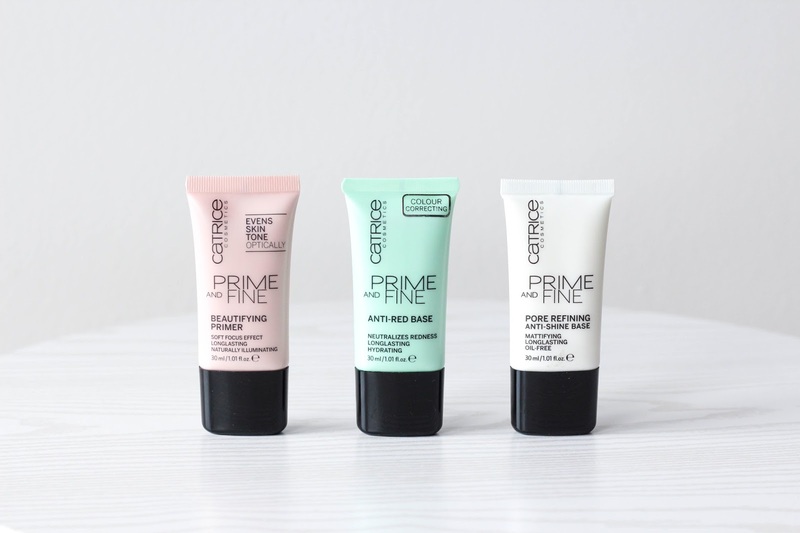 Prime&Fine Pore Refining Anti-Shine Base, mattifying, long-lasting, oil-free. What it claims: Lightweight primer minimises shine and reduces optically the size of pores. Long-lasting. Dermatologically tested. Now for my thoughts. I find that primers are very important in a makeup routine, at least for me, because I have quite large pores, some redness and extremely oily skin in my T-Zone. I am in search of a drugstore primer that would take care of all the "imperfections" and would work well with my skin, so I am constantly on a hunt for new ones. For me these products are such a hit or miss that I need to try out all the brands that offer these kinds of primers to find the one that suits me best. Over the past month I've been trying out three Catrice primers that I listed above. I ended up being extremely impressed with the Beautfying primer, but dissapointed with the other two. All the products come in a tube of 30ml, so they're really practical to use and are available at around 4 €. The Pore Refining Anti-Shine base has a white, creamy formula (nothing like the moussey texture of the Porefessional from Benfit or the Pores No More from dr. Brandt). It applies smoothly and absorbs well + doesn't contain silicones and is oil-free. But while the oil-free aspect may be true, it does not provide a mattifying complexion or significantly reduces the apperance of pores. As I've mentioned many times before, I have extremly enlarged pores and really oily skin in the T-zone, so this product unfortunately did nothing for my skin. It did not minimize my pores at all and after an hour or so my face was oily throughout. I have also tried it on my friend's skin, who also has extremely enlarged pores, and it didn't work for her as well. If you have normal to dry skin and rather small pores this product may work for you, but in my case the primer was not successul. The Prime and Fine Anti-Red Base is a correcting primer that cancels out the redness of your complexion. I've tried out the correcting technique many times before (stick concealer) but nothing really impressed me enough to include it in my daily routine. It still feels like just another unimportant and not needed step in my already long daily makeup routine. It has a green creamy formula that contains some shimmer and glitter, so I advise you to swatch it before repurchasing it. I used it after I moisturized my face. I personally find it really hard to blend the primer properly, because of the texture and really high pigmentation, which in this case is not really a bonus, because it left my face appear extremely pale with vibrant green hues - very visible even under my medium to full coverage foundation. Whenever I wore this primer, people kept asking me thorughout the day, if I was feeling ok and that I looked sick. It does slightly tone down the redness but also leaves you looking green - that's why this product is a pass for me. After trying out the first two primer and being rather dissapointed, I was really sceptical with the Beautifying Primer. 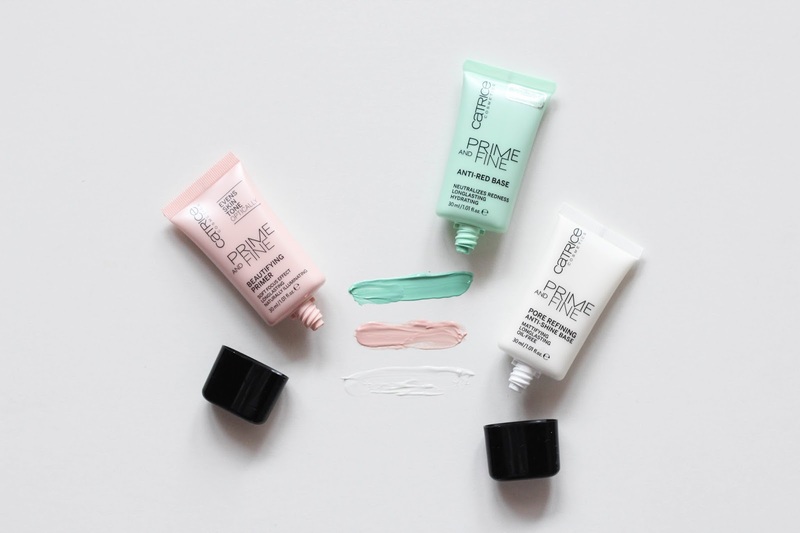 But ever since the first use, I've been absolutely loving the Prime and Fine Beautifying Primer - it makes your skin look radiant and awake with it's bright and peachy shade. I keep this primer out of my oily T-zone, but I love to add it on my dry areas like my chin, cheekbones and under the eyes. I always have a difficult time achieving a healthy glow without making my complexion look greasy. It has a light, creamy texture that absorbs quickly, smoothes the skin and creates a nice glowy complexion, so that the foundation (I currently use the L'Oreal Infallible 24h Matte foundation) doesn't adhere to the dry patches. It also doesn't change the tone of your complexion, like the green one, but simply gives it a brighter appearence. If you, again, have normal to dry, especially dull skin (or even combination type, just like me) that needs a boost of energy and brightening, you will absolutely love this primer. Plus, it's a very affordable option! Fine lines problems are common in now days. This type of problems are common in women after 30's. After 30's every women face such kind of signs problems. Anti-aging problems comes after 30's. So it is important to avoid that problems with good anti-aging skin cream. To be honest it really worked for me. Though I have dry skin so it makes my skin oily but not that much and it provides a proper moisture to the skin. Small amount is good enough. Looks great surely gonna try them. While choosing the best creams choose for the velvet like structure and research for the ingredients such as amino peptide and vitamin B3. These ingredients helps to remove the fine lines around the eyes and brighten the area around the eyes.